Bradley Wright-Phillips: Could New York Red Bulls forward be the best MLS player ever? Who are the best players to have graced Major League Soccer? David Beckham? Kaka? Landon Donovan? David Villa? How about Bradley Wright-Phillips? Last seen in England at League One Charlton, the former Manchester City and Southampton forward has scored 108 goals since his move to New York Red Bulls in 2013. The 33-year-old is the top scorer in the MLS over the past five seasons and has won the league’s Golden Boot twice. “You could make an argument that he is the best player to ever play in this league, and the best goalscorer to play in this league,” said Red Bulls head coach Jesse Marsch. Of English players in the top five European leagues, only Harry Kane has a better goal record than Wright-Phillips’ since he moved to the US – and the Red Bulls star could add to that tally against New York FC on Saturday. It is a remarkable turnaround for a player who said “football came second” in the first stage of his career and admits he did not “respect” MLS when he arrived in the US. 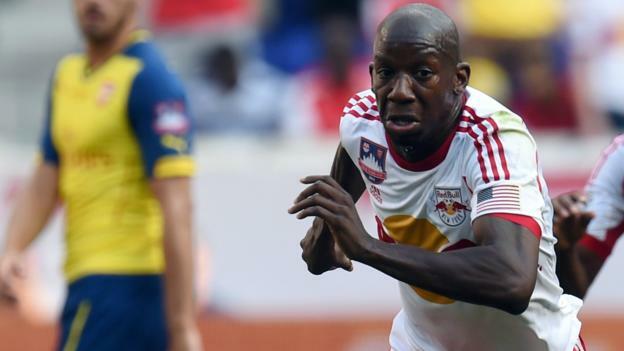 Wright-Phillips spoke to BBC Sport about failing to reach his potential in England, a New York gamble, Thierry Henry’s advice, and the reason he would never return home to play. “Growing up all I wanted to do was score goals and celebrate with fans – somewhere in that I got lost,” said Wright-Phillips, reflecting on his early career. Son of Arsenal and England striker Ian Wright and younger brother of Shaun Wright-Phillips, the south Londoner’s career started in Manchester City’s youth team, before he made his Premier League debut in December 2004, scoring just four minutes after coming on as a substitute. But after two seasons at City, he began to fall down the divisions. He was sold to then-Championship side Southampton, then to Plymouth Argyle and finally ended up at Charlton, from where he was also loaned out to Brentford. Wright-Phillips admits he “lived like a college student” at times during his years in the Football League. “I would stay up till 3am playing Xbox or Playstation, go training at 8.30am, go home and sleep and wake up at a crazy time like 7pm and eat something ridiculous like a pizza and then get back on my computer. I was not living right and I wondered why I was not starting games. “At the end, when I was getting ready to leave Charlton, I was not sure what I was doing. I was not really enjoying the game and it was tough to focus on football”. But then came the opportunity to train with the Red Bulls. When Wright-Phillips arrived in New York, he was joining a club that already boasted former Everton forward Tim Cahill and Arsenal legend Thierry Henry. At first, his horizons barely stretched beyond England and he admits to thinking the MLS was “where players go for retirement”. Five years on, he says the move with his family, was the “best decision I could have made”. He began to work on his game and dedicated himself to life as a professional athlete. “I tried to start over,” he says. “I had to put my head down. It was like my last shot at enjoying the game and doing something I could be proud of. “I did OK in England – that was me just not really giving it everything. Then I realised that I still had time to play and make a name for myself. Wright-Phillips, who lives in New Jersey and earns $1.5m a year (£1.1m), says the “lifestyle is better” in the USA. He gets recognised “sometimes” but is enjoying being away from the “hustle and bustle” of home. “It’s hard in England,” he explains. “If I didn’t score for three games, there was the chance someone would take my place or I would be loaned out. He says being able to lean on the likes of Henry and spend time in New York and LA holds much more appeal than “playing away fixtures at AFC Wimbledon – no disrespect to them”. So, too, does lining up against legends of the game such as World Cup winner David Villa at New York FC and Sweden’s Zlatan Ibrahimovic at Los Angeles Galaxy. Wright-Phillips is now the Red Bulls’ all-time record goal scorer and 11th in the league’s all-time list, but says he thought “no-one would know or care” if he did well in MLS. He represented England Under-20s, but never made the step up to the senior team. An approach was made by Jamaica but it “did not work out”.